1. 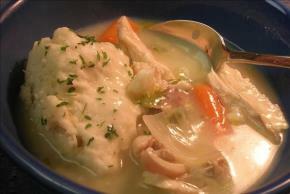 Combine chicken, celery, carrots, onion, chicken broth, parsley, chicken bouillon granules, salt and pepper in a large pan or Dutch oven; add enough water to cover chicken. Bring to a boil; reduce heat, cover and simmer for 2 hours or until chicken is done. 3 Remove chicken and let stand until cool enough to handle. Remove skin from chicken and tear meat away from bones. Return meat to soup; discard skin and bones. Add more salt and pepper to taste, if desired. Return soup to a simmer. 3. In a mixing bowl, combine dumpling ingredients and mix well to form a stiff dough. Drop by tablespoonfuls into simmering soup. Cover and simmer for 15 to 20 minutes. Serve immediately.